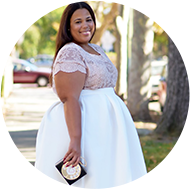 Because of the great response from the previous featured holiday dress, Jibri has decided to give "The Curvy Girl's Guide to Style" a gift certificate to giveaway to one of it's lucky readers. You can check out the clothing line at www.jibrionline.com or the Etsy shop at http://www.etsy.com/shop/jibrionline. The winner will receive a $75 Gift Certificate to be used towards any purchase. If you order by Tuesday 12.22, you'll get the piece in time to wear it on NYE!! JIBRI, is also offering all Garnerstyle readers free shipping until 12.31.09! All entries must be received by 11.59pm Eastern time by Sunday, December 20th. This will allow Jibri to get you your piece right before NYE! I will announce the winner early on Monday, so please check back. Please comment to the post - 'Enter Me' with a valid email address. Remember to follow "The Curvy Girl's Guide to Style" so you can get updates on contests like this one. Good Luck & Dream Big! This contest is only good for U.S. residents only, sorry my out of country followers. enter me!!! byotch78@gmail.com...i can finally grab that high waisted skirt to go with my grey pin striped blouse I picked up a few weeks back!